The primitive destiny of the land is obscure, but it has been obscured further by a field of unrelated culture stuccoed upon it that has made that destiny more difficult than ever to determine. To this latter nearly all the aesthetic adhesions of the present day occur. Through that stratum of obscurity the acute but frail genius of the place must penetrate. All have to come from under and through a dead layer. A Brief Reflection on Bastardized-Standardized-Assessed Sameness from the Trenches. Fact: A classroom is a living, breathing, dynamic entity, always on the brink of the beautiful unknown from any prescribed activity. Unfortunately, most executive-type-educators feel such negative connotations from that very word: unknown. In this 21st century, we have become obsessed with standards and assessments as the end-all-be-all of student engagement – the what?, if you will, of education. In a nutshell – if we can’t measure it, the students aren’t learning it! This bound-in-a-nutshell approach leaves classroom teachers at the mercy of such CCSS’s to the point of absurdity. As carefully as I have mapped my daily lessons, very seldom do I follow that structure precisely or even reference them. I’m constantly measuring the classroom climate and culture on a minute-to-minute basis. Perhaps it was my greatest of intentions to discuss gender roles in The Canterbury Tales in class today, but maybe our assignment on Annie Dillard’s “Living Like Weasels” has taken on new forms of learning and excitement. Ok, so we snub the literary discussion for an exercise on imagery through descriptive writing. Have we lost? Has the day been shot? Are the students not learning? Surely, we can find some time later to discuss such topics, right? Yet, there seems to be this drive to systematically follow these maps as covenant*. Education is not a set procedure with a set outcome; teachers and professors have varying approaches, different attitudes, a multitude of personalities; neither is the work-force structured in the same way. There is always the possibility of the unknown, the un-chartered. If we are truly teaching students “real world and college readiness” then we need to skip the mandated scripts, and allow above mentioned variations. Ask yourself: how many times has a boss thrown a wrench in your daily schedule with a meeting, or extra paperwork? I find it remarkable how often an upperclassman reminds me of old conversations from their freshman year. All too often, I fail even to recall the conversation, and furthermore, the content had no relation with any lesson-plan of mine. It is always some side-conversation, some digging around in the muck, or the murky outcroppings of some shallow shale, splitting effortlessly into smaller strands. This is what sticks. These are the lessons he carries with him. Nothing scripted, just plain old conversation. One immediately recognizes the subversive in this tale; the cunning, deliberate attempt and success of “master and company” for their own benefit; their own profit, their own fears of an unknown alternative in the hands of “others.” Whose good is served here? What righteousness prevails? What passengers do we leave behind? Such “fakery” is thus the conversation of the hour in education. Here “master and company” are synonymous with educational bureaucracy – a core of men and women influencing the classroom with CCSS’s from the outside as if they know what is “best” for the journeymen (teacher and student)? Rather than allow freedom of thought and expression based on teacher-student relationships (weightlessness), they have manipulated the entire school day/year into compartmentalized standards, aka “unnecessary weight.” They pretend that such mandates facilitate true instruction; promote continuity amongst youngsters. But the process is otherwise dilatory. They have bogged down each lesson with time-consuming and ambiguous “standards.” They equivocate for sameness (the known), under a pretense of individuality. They increase teachers’ already hefty workload; they forestall the journey. Simply, we have over-masted our ships. *There is a push in our school structure for each teacher to deliver the same lesson, same assessment, same tests, same exams, etc. for each discipline. 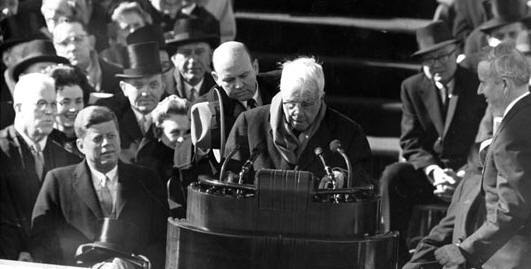 Robert Frost’s inaugural poem for John F. Kennedy’s 1961 presidency reeks of colonialism and that ever-present European desire of westward expansion. According to his brief poem, this country was “unstoried” and “artless” only to be enlightened by British/American warmongers and “cultural” developers that quickened a storyline for an otherwise empty vastness. Then, at 86, Frost was a four-time Pulitzer Prize winner, and would die just two years later, bequeathing his name to the annals of American poetry to the delight (or chagrin) of American schoolchildren forever. Much like T.S. Eliot however, Frost was more expatriate than American poster-boy in his earlier days; he himself a failure at New England farming only to exile himself to a cheaper living standard in England during the brief period of 1911 to 1915. It was during this time that he published (to great European acclaim) his first book of poems, A Boy’s Will. As evident in his first batch of poems and throughout his career, Frost owed more allegiance to the British tradition than his American contemporaries such as William Carlos Williams and Wallace Stevens, themselves dabblers in the “everyday”, imagism, and sometimes the Eastern. Similarly to his inaugural poem (“The Gift Outright”), Frost’s other poems possess an eerily contemplative look at “histories.” His own history, rife with sorrow, depression, familial suicide, perhaps subconsciously governs his more ominous ones. Even the always misconstrued “Road Not Taken” appears every Spring at high school and college graduations as some tome for living and choosing the “right” path. Unfortunately, our best and brightest valedictorians misinterpret the sadness and regret of that poem – the unalterable truths of our very own history – for something cheery and refreshing. For me, Frost’s greatest “history” – so desolate and yet all-encompassing in its own confusion – is “Directive”. Once we find this palatable new-truth for ourselves, we are asked to close up shop, roll up our past, and make ourselves “at home”; in other words: content. Here, as in “The Road Not Taken” the speaker begs for an element of complacency. We are inclined only to please ourselves, to trick the mind that our journey has nevertheless been worthwhile – “to weep for what little things could make them glad.” It is in this “could make” that resonates most. Your past, our past is only what we imagine or re-imagine it to be – a potential Holy Grail mixed in with other odds-and-ends of living, scattered next to the archetypal brook, supplying us with water, once frozen a million years ago and now the source for our re-invention, our wholeness, if we choose to drink. Thus, as in “The Gift Outright”, we are this land, this water; and we are asked to drink, to make our own stories, to make our own histories, to interpret our own existence for ourselves, and that has made all the difference to me. Eric Sargent teaches English at a private high school in St. Louis.